Design a card which interacts with the opponents deck. Current examples in the game are Genesis Spy which adds useless tokens to their deck, USS Enterprise which steals a card from their deck and I guess Martyr of Chaos which swaps your decks and makes all the cards in their deck cost 10. That said your card doesn't necessarily have to change the opponents deck or its cards at all, for example you could have a character card that has higher stats the smaller your opponents deck is or the higher the number of ability cards in their deck or something. Card can be whatever type you want and have whatever effect you want as long as it either affects or reacts to the cards in your opponents deck in some way. Deadline is the 23rd of Jan.
Not trying to steal it or anything, but the main list was just missing too many abilities and Pelagoth hasn't been online for the past year. If there's any issues or if I missed anything or any suggestions just PM me and I'll make edits. So here's the updated version with some categorization, duplicates removed, slight re-writes for consistency, clarity and grammar/spelling and some examples/explanations (where provided). While this Character is in the Assault Zone, it has +X/0. The base power and max health of this Character is always 1 more than the highest power and max health of all other Characters in-play with the same sub-type. Meaning, if the paragon is a demon and there are 5 other Demons deployed with power and health like so; 1/6, 2/5, 3/4, 12/1, 7/7. Then the paragon's base power and max health would be 13/8. This changes as demons come and go and if all other demons are out of play, the paragon would be a 1/1. Characters that enter combat with this Character have -X/-0 until the end of turn. If this Characters health is half its max health or lower, it is locked to the Assault Zone and has +X/+0. This Character has +X/+0 during its next combat, after the combat Impact is removed from this card. This Character cannot be debuffed. This Character gets +X/+0 at the end of each turn. This Character gets +X/+X at the end of each turn. This Character gets +X/+X each time it enters combat and survives. This Character has -X/-X if it is not on the battlefield. When this Character enters combat, remove all buffs and debuffs from the opposing Character for the duration of combat. When this Character attacks, it ignores the first X defending Characters. This Character cannot be blocked by Flying Characters. When this Character attacks and would kill a defending Character, it deals damage to the opponents fortress equal to the damage taken by that Character minus that Character's current health. If this Character attacks and the opponent has multiple defenders, it attacks the defender with the least power. If this Character attacks and the opponent has multiple defenders, it attacks the defender with the least health. If this Character attacks and the opponent has multiple defenders, it attacks the defender with the most power. If this Character attacks and the opponent has multiple defenders, it attacks the defender with the most health. This Character cannot be blocked by Characters with cost X or less. When this Character attacks, it enters combat with Characters from the right side of the zone instead of from the left side. Characters on the right side of your Assault Zone have Flanking until the end of the turn. Basically half your assault hits the left-most defender, half hits the right-most defender. When this Character attacks, it enters combat with Characters in the opponent's Assault Zone instead of their Defense Zone, attacking the fortress if their Assault Zone is empty. When this Character attacks, it enters combat with Characters in the opponent's Support Zone instead of their Defense Zone, attacking the fortress if their Support Zone is empty. Basically put one of these in assault and every turn they'll attack the character with the least health in your opponents support zone, damaging/killing units that haven't had a chance to get on the battlefield yet or are avoiding combat like wealthy noble. This Character can only block Flying Characters. This Character moves to the back of the Defense Zone after blocking an attacker. If this Character is in the Defense Zone and the opponent has multiple attackers, this Character blocks the attacker with the least power. If this Character is in the Defense Zone and the opponent has multiple attackers, this Character blocks the attacker with the least health. If this Character is in the Defense Zone and the opponent has multiple attackers, this Character blocks the attacker with the most power. If this Character is in the Defense Zone and the opponent has multiple attackers, this Character blocks the attacker with the most health. Whenever an opposing Character attacks, that Character enters combat with the leftmost Character you control with Guardian on the Battlefield. This Character takes and deals no damage the first X times it enters combat each turn. This Character will not attack or block. This Character deals its damage before the enemy the first X times it enters combat each turn, taking no damage if the opponent dies. This Character will not attack or block Characters with more power than itself. basically if it attacks and say theres one defender with more power and one with less, it skips the first one, if they both have more power then it just doesnt attack at all. if its defending and a higher power character tries to attack it the next defender does the blocking, if there is no next defender the attacker hits the fortress. a blessing and a curse, it wont suicide itself on a high damage blocker and will survive longer in defense, but it also wont attack defenders it could survive against if its health is higher than its power and can potentially let strong units through to your fortress. This Character deals combat damage after its opponent during combat, dealing no damage if it is killed. When an adjacent Character deals combat damage to an enemy Character, this Character deals X damage to that enemy Character. If this Character takes damage in combat and both Characters survive, it enters combat with the same Character again. Kinda like Unstoppable but continuing on enemy survival rather than death and it works in defense as well, basically when in assault if it fails to kill the defender it'll keep attacking them until it kills them or dies, in defense it basically just gives the attacker multistrike every time it survives the combat. If this Character would enter combat with a Character that has an equal or higher cost than itself, it moves to the Support Zone and is exhausted instead. The next time this Character deals damage in combat, the other Character is killed and Fatal Blow is reduced by 1, at 0 it is removed from this card. Basically you could chuck this in the back of your defense zone and the first flyer in their assault zone will be killed when it attacks, but after that first kill its just a reach character. When this Character deals combat damage to an enemy, it also deals damage to the Characters adjacent to them. When this Character dies it explodes, dealing X damage to all other Characters in the same zone. Characters dealt damage by this source die at the end of the turn. The next time this Character would die, instead its remaining health becomes 1 and Resilience is removed from this Character. If this Character is at full health and would die, instead its remaining health becomes 1. If this Character takes damage, it dies. At the end of each turn the Doom counter decreases by 1, at 0 the card is destroyed. This Character cannot be killed by non damage sources. If this Character would die before the end of the turn, instead it survives at 1 health until the end of the turn. When this Character enters the deployed area, you may target a Character you control. Each time this Character takes damage or is healed, the damage or heal is split between this Character and the targeted Character. Characters dealt damage by this source gain an additional X Poison. Whenever this Character takes damage it takes X additional damage. At the end of each turn this Character is healed for X damage. All Characters in your Support Zone have Regeneration 5. Whenever an adjacent Character takes damage, half of that damage is redirected to this Character. This Character takes half damage from combat, but double damage from Abilities. Whenever this card is affected by an Ability, the owner of the Ability takes X damage. If this Character were to take damage deduct that damage from the Barrier amount instead. If the Barrier amount is less than or equal to 0, remove Barrier from this card. Deal damage to a Character equal to its current health. The card can be one of the subtypes and/or interact with one of the subtypes. Aside from that I'm not looking for anything particularly specific so take whatever direction you like. Basically the idea is we can do more with the 'OR' type cards than just single purity. The number in the middle signifies how many commanders the deck must have that belong to either of the factions shown. A '1' card is the same as the current 'OR', only requiring 1 commander of either faction. A '2' card requires 2 commanders of either purity. A '3' card requires 3 commanders of either purity. Needless to say this would open up more possibilities for card faction groupings, allowing cards to be used in multiple factions without sacrificing the balancing quality of double/triple purity requirements. above the textbox, people could just click on one and boom, faction icon in the forum post instantly. There's a lot of info online on how to add custom smileys to your forum so it shouldn't be hard to do and would be cool for all the users. Hell I could do it myself if I had access. I want to see your designs for a card that becomes a different type as part of some sort of transformation/transition. The only existing card I can think of off the top of my head that does something like this is Weaponize, and that just turns an artifact into a textless, generic token. I'd like to see some more interesting cards using this mechanic on themselves, not just turning a separate card into some token. The change could be one-way or reversible, and while it may be practically identical mechanics wise I'm not really looking for a card that is used just to create another card, basically it should be a continuation of the same object/being/effect, just in a different form, more or less. Bug Reporting / Tulio + Swift strikes = ??? Tullios ability simply gives multi-strike 3, rather than adding extra attacks like swift strikes does. I can just imagine someone gifting a few hundred copies of the avatar to someone. Had an idea for a deck based on a card combo and just threw it together, I haven't really used it much in pvp since I'm still kinda getting back into pvp, but so far with testing I think it's pretty cool. Basically you just defend while generating decent flyers, if you really want to you can save them all up for a OHKO. The idea is you use DOD and Rita tokens to defend, while (if convenient) sacrificing spare small units with the Summoner and removing units from the graveyard with Xi, while also removing flyers you have with Dojo, when you think you have enough stockpiled you can then spawn the flyers in and do some decent damage or defend if necessary. Essentially by sacrificing and then removing the same character you can turn 1 character into a 3/3 flyer and a 4/4 flyer, with the Dojo then buffing them to 7/7 and 8/8. 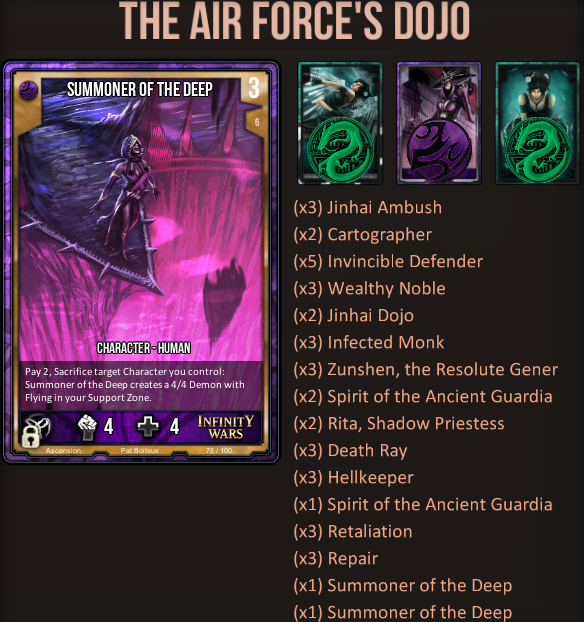 Combine this with Xi Ascended's and Hellkeeper's 6/6 flyers (becoming 10/10s after dojo) and it can be pretty strong. It's built around the old version of Veroria, so it could probably use an update.